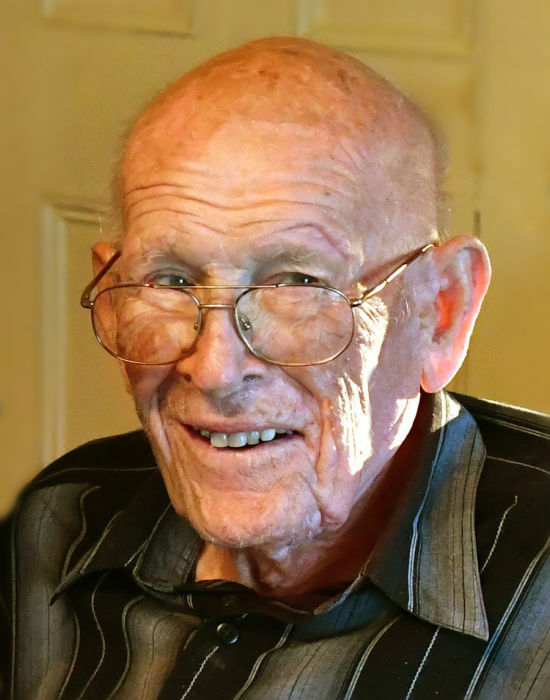 Irvin Leroy Gerig peacefully departed this world the morning of Tuesday, September 4, 2018, at the age of 98. He was surrounded by family at the time of his passing at Samaritan Evergreen Hospice in Albany. Born in Albany on August 17, 1920, Irvin grew up on a farm in nearby Crabtree where he helped work the land with horses. His strong work ethic exhibited throughout his life could be traced back to those early years on the farm. His love of learning began as he attended Lakeview Elementary School. He graduated from Albany High School in 1938, one of the few of his peers to do so in that era. His diminutive stature was a struggle for him in his early years, but it also enabled him to convincingly play the role of Tiny Tim in Charles Dickens’ "A Christmas Carol" during high school — an accomplishment of which he was very proud. He never stopped being a student and more often than not in the evening hours would be found in his favorite blue recliner reading or working on crossword puzzles from the day’s Albany Democrat-Herald. Irvin spent his entire career involved in agriculture. After World War II, he went to work for his good friend Aaron Ropp in his grass seed warehouse. This was eventually sold to Northrup King, where Irvin became warehouse manager. In 1965 became an independent dealer for SURGE brand dairy equipment. He primarily serviced farms in the Willamette Valley but his expertise also took him to Palmer, Alaska, where he installed equipment in three different dairies. He sold the business in 1986. To honor Irvin on his 90th birthday, his grandchildren surprised him with the creation of an Albany city league softball team named “Grandpa’s Team." For nine consecutive seasons, Irvin’s grandchildren and their friends have taken the softball field each summer in honor of “Grandpa Gerig." On August 19, 2018, Irvin attended what would be his last game, this time in honor of his 98th birthday. The team took the field on September 9 and grandchildren from across the U.S. were in the lineup. His devotion to his family was only exceeded by his devotion to God. Each morning he would lead his family in a reading of Scripture followed by prayer. This lifelong habit transcended generations and served as an example for all those in his family who followed him. His love for and deep understanding of God’s Word served as the basis for the counsel he provided both family and friends when it was so frequently sought. In recent years, he greatly missed being able to attend New Hope Church in nearby Lebanon where he had been a faithful member. On June 12 of this year, Irvin and his beloved wife Lois celebrated their 71st wedding anniversary. The longevity of his life and marriage yielded four children, 14 grandchildren and 13 great-grandchildren. Irvin is survived by his wife Lois; daughter Carolyn Krabill (Lyle), grandchildren Kristin, Andrea and Ryan; son Loren (Patty), grandchildren Sherilyn, Stephanie, Michael, Matthew and Daniel; daughter LuAnn Brenneman; grandchildren Casey and Amanda; and son Lynn (Lori), grandchildren Alyssa, Joshua, Barbara Joy and Angela. The family would like to express thanks to the wonderful caregivers at Waverly Place, and the help and support of Samaritan Evergreen Hospice. A private burial was held for the family at Fairview Mennonite Church in Albany. A memorial service for Irvin will be held at 10 a.m. Saturday, Oct. 20, at New Hope Church, 37180 Gore Drive, Lebanon. Donations in Irvin's honor could be made to Samaritan Evergreen Hospice or to New Hope Church, 37180 Gore Drive, Lebanon, OR 97355.